The cameras will be operated by the Canadian Urthecast company, which intends to stream high-resolution video of the planet to web users. 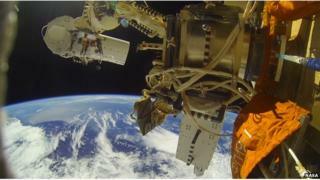 Russian cosmonauts completed the attachment in a six-hour spacewalk on Monday. It followed an aborted installation attempt in December. On that occasion, there was a difficulty in getting telemetry through to Moscow mission control. In a statement on Tuesday, Urthecast confirmed that both cameras were passing data to the ground following the latest effort. "During the installation, we were able to complete all of the intended tests during the spacewalk," the statement read. "At this time, all telemetry received and analysed is within our expected results." The cameras were made for Urthecast by the Rutherford Appleton Laboratory (RAL) in Oxfordshire, UK. The high-resolution video unit should provide a resolution on the ground of about 1m per pixel. Large crowds and moving vehicles would be visible on this scale. The second camera will provide static imagery at a medium resolution of 5m per pixel. "Testing of every part of the camera system will now follow. Once that's completed, we can expect the first imagery to be released publicly," said Prof Richard Holdaway, the director of RAL Space. "We'll be helping Urthecast. We'll be checking the optical alignment and focus, to see that it is everything we expected," he told BBC News. Urthecast hopes to build a business around space station imagery. One of the customer sectors for the hi-res video, for example, is likely to be news organisations that want moving pictures of major events, such as war zones and regions of the Earth hit by natural disasters. It is hoping also to generate social media buzz around its imagery products, by enabling people to tag and share pictures through a special web portal. Urthecast is one of a group of Earth observation start-ups currently in the process of launching and commissioning space hardware. Skybox Imaging of San Francisco has already started to showcase video of Earth acquired by its small, free-flying SkySat-1 satellite. And Planet Labs, another San Francisco venture, has a "flock" of 28 nano-satellite imagers that are about to be released out of the airlock on the ISS. The station itself is increasingly becoming a platform for Earth observation. This is quite a challenge, however. The movement of the astronauts inside the ISS makes it flex, and there is a constant vibration from onboard equipment. All this requires cameras to have dampers built into their rigs to maintain a steady shot. The US space agency (Nasa) will be launching another two Earth-observing instruments to the station this year. One will study ocean winds and storms; the other will examine small particles in the atmosphere that can influence the climate.